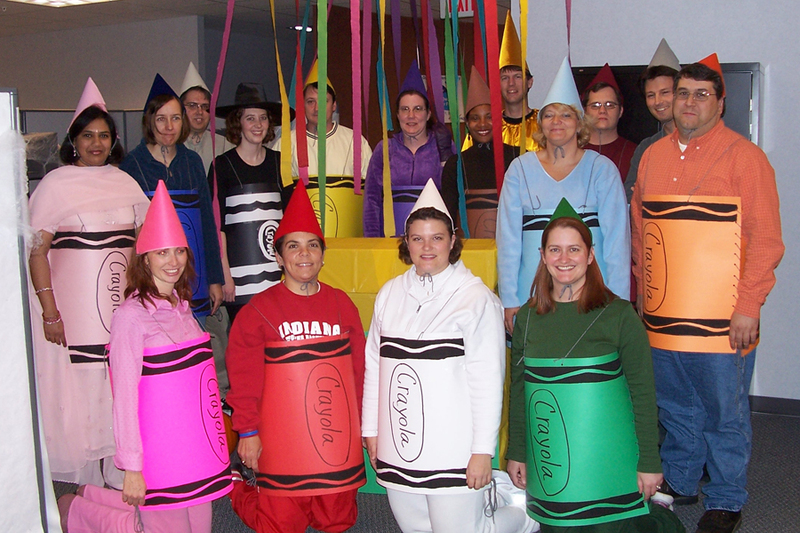 A test team I once belonged to, dressed as crayons for Halloween. I’m the gray crayon, natch. Our colorful dunce caps do not mean we weren’t A players! No doubt about it: A players are extremely talented and deeply experienced. They are heavily self-motivated and especially hardworking. They are creative problem solvers who focus on getting the job done. But don’t assume that putting A players on the job is like sprinkling magic fairy dust that makes problems go away. That’s setting them up to fail – and setting your company up to fail, too. Companies are much better served building high-performing teams. A players are hard to find. A reason why I often hire B players is because most people aren’t A players. I’d say less than one in ten people I’ve ever worked with are that good. I make software in Indianapolis, which we sometimes call the Silicon Cornfield. Many of the truly outstanding geeks move to California, North Carolina, or Texas, where the opportunities are greater. But even in those places, there are only so many A players to go around. Sooner or later you have to hire B players too. Those B players will work best under strong leadership and in highly functioning teams. A players often have the biggest egos. A little swagger is part of the A-player territory. If you don’t lead well and help them gel into a team, conflicting egos will put your projects at risk. A long time ago I followed rec.music, a once-popular Internet forum about music. In a recurring discussion thread, members wrote about which musicians they’d put in the best supergroup ever. The debate raged – Eric Clapton on guitar, and Neil Peart on the drums, and Paul McCartney on bass, … no no, Phil Collins on drums and Jeff Beck on guitar! …no! It must be John Paul Jones on bass! It was fun to fantasize about such things. But do you really think a band with some of the biggest egos in music would gel? I’m reminded of We Are the World, the 1985 charity song recorded by a supergroup of pretty much every popular musician of the time. The famous story goes that someone taped a sign that read, “Check Your Egos At the Door” on the recording-studio entrance – but that didn’t stop arguments over many of the recording’s details, with at least one musician walking out and not returning. Don’t let that be your team. Lead roles – I needed someone to figure out some thorny problems, and to set the pace and point the way for the team. Lone wolves – I needed someone for a highly specialized job where I was unlikely to need more people in that role for a long time, especially a role where I lacked the skills to do it myself and therefore would have a hard time managing its details. Really, I’ve never not hired an A player just because he or she was an A player. Who wouldn’t want their skill and determination on the team? I’ve only passed on A players when they would be a poor cultural fit in my company and in my team.